Xiaoyan Zheng, an assistant professor of anatomy and regenerative biology, said her research can potentially create treatments for birth defects and some cancer types. A professor in the medical school received a $1.7 million grant last month to further investigate treatments for a cell-signaling pathway that can lead to cancer and birth defects. 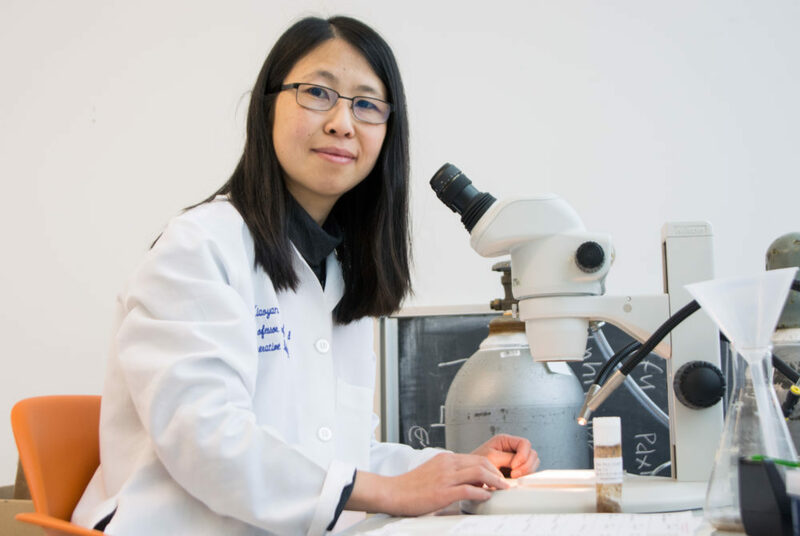 Xiaoyan Zheng, an assistant professor of anatomy and regenerative biology, said she is studying the regulation of cell interaction along this pathway and her research can potentially create treatments for birth defects and some cancer types. She said the grant, from the National Institutes of Health and National Institute of General Medical Sciences, will allow her to continue examining what she called an under-researched but impactful topic. “I am very much interested in cell signaling, which is important in development, regeneration and disease,” she said in an email. Zheng’s research focuses on the Hedgehog receptor pathway, or Hh pathway, a lane that channels information to the cells of an embryo. It is named for the appearance of fruit fly larvae who do not have the Hh gene and resemble small hedgehogs, she said. Zheng said she has worked with cultured cells — cells grown in the lab under controlled conditions — and animal models to conduct her research. She said she uses specialized imaging techniques using microscopes to examine the cells in an effort to develop effective treatment. She first applied for the grant in February 2015 and later re-applied for the funding in March 2016. She found out last month that she would receive it. The loss of effective cell signaling and coordination between cells in this type of pathway can cause birth defects, like a cleft lip and palate, Zheng said. Complications within this pathway can also arise for adults and can lead to cancer, she said. She said this project will focus on uncovering the mechanical functions of the pathway. “Our ability to therapeutically modulate Hh pathway activity is limited by an incomplete understanding of the mechanisms underlying pathway activation,” Zheng said. She said understanding how this crucial information channel functions will provide a basis for developing treatments to potentially combat degenerative diseases caused by malfunctions within the pathway. Zheng said that she began this type of research at the beginning of 2013 and that she hopes to complete the research within the next five years. Zheng’s team is comprised of two post-doctoral students, Ya Zhang and Xuefeng Wu, three research assistants, Arianna Caprioli, Xudong Cai and Xiangyang Zhang, and one visiting scholar, Zhuo Liu. The team uses the resources of the medical school and works out of Ross Hall.